Earlier this year, PNG church partners, which have been formally recognised by the Government, worked together to coordinate needs assessments and to identify at-risk communities. 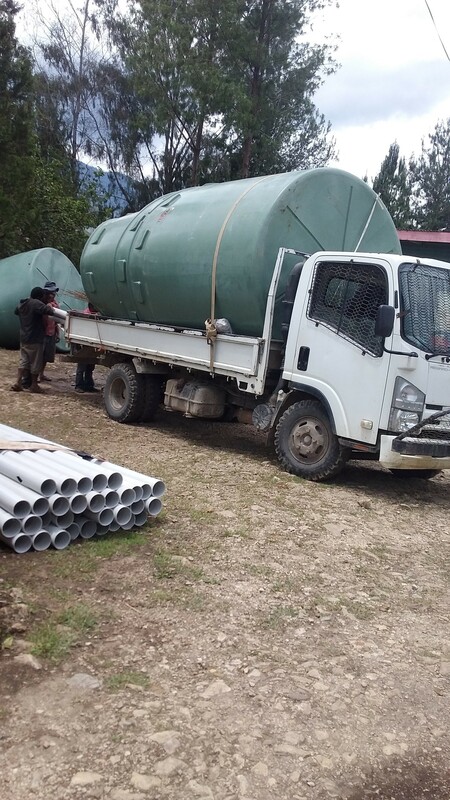 Latest update (Nov 2018) – the money we raised is being used by Anglicare PNG to assist affected communities in the Southern Highlands region to get back on their feet. This includes the provision of large water tanks as shown in the photo. This one has been loaded onto a truck and will be installed at the United Church South Mendi in the Highlands. The church has prepared the site for the tank and is providing labour. Church leaders have been providing with training on the need for clean and safe water and in how to promote healthy communities. Fatalities from the devastating 7.5 magnitude earthquake which affected large parts of the Highlands region on 26 February now exceed 100. This was the largest quake to hit the Highlands region in more than a century. While a State of Emergency was declared on 27 February, responders are still struggling to reach remote areas. Aerial assessments show significant damage and large landslides. Water is scarce in affected areas due to damage to storage facilities and water sources. The United Nations estimates up to 465,000 people have been affected and an estimated 247,000 people are likely to require immediate assistance. There have been dozens of aftershocks with the largest, a 6.7 magnitude earthquake hitting the same region yesterday (8 March) with media reporting further deaths. Another significant quake (6.8 magnitude) rocked eastern New Britain earlier this morning (9 March). However unlike the devastating Highlands quake, today's quake comes in an area known for seismic volatility. There are no reports of injury or severe damage. Australia’s Anglican Board of Missions (ABM) has launched an appeal and wants to raise AU$50,000 for immediate humanitarian aid (food, water, shelter). ABM is working directly with the Anglican Church in PNG (which in turn is part of the Church Partnership Programme). The Church Partnership Programme in PNG has brought together members of the Anglican Church, the Baptist Union, the Catholic Church, the Lutheran Church, Salvation Army, Seventh Day Adventist and the United Church. The United Church is establishing church-led response centres in Tari, Hela Province and Mendi – all in the Southern Highlands, in order to coordinate initial needs assessments and share church actions and to help ensure a coordinated church-based response and recovery effort. Given the severity of the earthquake, the number of fatalities, the fact that recovery and rebuilding will take years, the central role the church plays in PNG in responding to natural disasters and the strong history and level of partnership between the Anglican Church of PNG and the Anglican Church of Aotearoa, New Zealand and Polynesia, we commend this Appeal to you. Anglican Missions will work closely with ABM and the Anglican Alliance to help ensure a collaborative and coordinated Anglican response and will provide updates via the Anglican Missions website. Your prayers for the people of Papua New Guinea are very much appreciated. If you or your parish would like donate to this Appeal, please refer to our donate section. If you have any questions, please contact the Anglican Missions Office: email info@angmissions.org.nz or phone (04 473 5172).